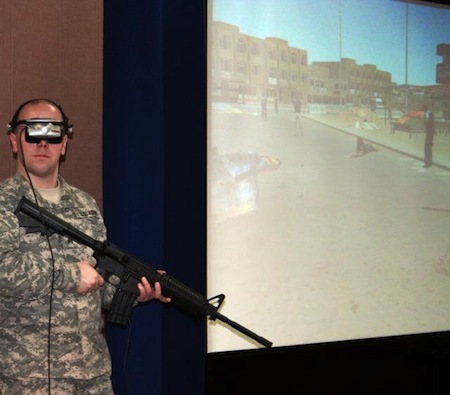 It looks like Virtual Reality Exposure Therapy will be tried with the soldiers returning from Iraq. The Department of Defense National Center for Telehealth and Technology, in partnership with the Defenses Center of Excellence for Psychological Health and Traumatic Brain Injury, and the Department of Psychology at Madigan, were funded by the United States Army Medical Research and Materiel Command, to conduct a four-year study to determine the effectiveness of VRET on active-duty servicemembers returning from Operations Iraqi Freedom and Enduring Freedom who are suffering from PTSD. Through VRET, behavioral health providers can use 360-degree, interactive computer-generated environments uniquely tailored to expose the patients back into the environment and experience where the trauma occurred, to help reduce anxiety and post-traumatic stress. The congressionally-funded medical research study is the first randomized clinical trial that uses active-duty military diagnosed with combat-related PTSD to compare VRET results to traditional "imaginal" prolonged exposure therapy, and to a control group that waits five weeks for any type of treatment. The study's sample size is 120 servicemembers to complete the three types of treatment options. Treatment sessions for each type of therapy last about 90 minutes, said Dr. Greg Reger, the chief of T2's Innovative Technology Applications division. And the best way to participate in the study is to be recommended by a behavioral health specialist at Madigan Healthcare System or Naval Hospital Bremerton. The program uses the Virtual Iraq program (see 'Virtual Iraq' Therapy For PTSD. Patients undergoing VRET still explain to the therapist what happened that caused the trauma, but are exposed to a variety of computer-generated stimuli with the program "Virtual Iraq." VRET is designed to promote a multi-sensory emotional connection to the memory, thus helping the patient be able to gradually face the traumatic experiences that underlie his or her distressing memories after a number of treatment sessions. This connection is facilitated by having the patient put on a head-mounted display (over-the-eyes video glasses) and either ride or drive in a simulated convoy, and Reger matches the scenario to the event. Or a Soldier will be given a dummy M-4 with a mounted game controller and conduct a dismounted patrol, and Reger could simulate gunfire. Reger can customize the simulation experience ensuring ample control of the exposure to the programmed situations - changing weather conditions, terrain, helicopter flyovers, types of attack; even add in Muslim prayer call. Fans of the marvelous sf writer Roger Zelazny may recall his description of the Ro-Womb in his 1966 novel The Dream Master. In the novel, a psychotherapist used this device to control the dreams of his patients. Render turned away from the window and approached the great egg that lay beside his desk, smooth and glittering… He pressed the second red button. With a sigh, the egg lost its dazzling opacity, and a horizontal crack appeared around its middle. Through the now transparent shell, he could see Erikson grimacing, squeezing his eyes tight, fighting against a return to consciousness and the thing it would contain. The upper half of the egg rose vertical to the base, exposing him knobby and pink on half-shell… Render used this time to check the ro-womb.